If you’re looking for the next big SUV in your life in Savannah, you might be thinking of getting a 2017 Toyota RAV4. This powerful machine has the latest technology to make your drives great. Check out what you’ll get from the RAV4 with Savannah Toyota today. The 2017 Toyota RAV4 is one of the few hybrid SUVs on the market, and it’s also one of the best. The hybrid synergy drive unit gets up to 34 mpg highway and produces up to 194 net hp with its impressive li-ion battery and gasoline motor tandem system. It uses electronic on-demand all-wheel drive with intelligence, which uses an electric motor to deliver the torque you need to the rear wheel when you need it. The comprehensive energy monitor shows you how the gas engine, electric motor, and hybrid battery are using power and being charged. You can easily track when the system is using or generating the most power, so you can get the most out of your engine! From the cup holders to the lock, the 2017 Toyota RAV4 has lots of tech that’s dedicated to making your ride more convenient. The improved cup holders are designed to accommodate any size of mug or cup, handles or no. The integrated HomeLink system lets you control your front gate, garage door, and even your home security system with a few strategic touches of a button from inside your SUV. The power driver’s seat includes a memory function that you can program to remember your most comfortable settings, making sure that the 8-way power-adjustable driver’s seat and lumbar support is perfectly comfortable for you. Finally, the Smart Key system lets you keep your remote proximity key fob in your purse or pocket. The RAV4 will detect your presence, and lets you lock or unlock the doors with your presence, open the lift gate, or start the car by just pushing a button. The Toyota RAV4 has plenty of available technology that keeps you aware of your surroundings and in touch with the outside world. The Bird’s Eye View camera includes Perimeter Scan, which displays a full, rotating 360-degree view of the outside of your car so you can see what’s around you. The integrated backup camera automatically activates when your back up your car. Choose from an integrated or connected navigation system to get you where you need to go. 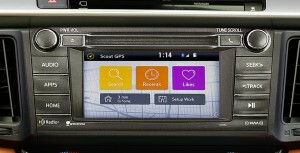 The in-vehicle navigation system uses Sirius XM satellite radio GPS signals to guide you, while the Engine Audio Plus system lets you sync up your smart phone to your in-vehicle computer so you can use your favorite maps app. Are you ready to get the stunning new up-to-date 2017 Toyota RAV4? Savannah Toyota can help! Call us today at (855) 411-6139 or come see us at 11101 Abercorn Street, Savannah.